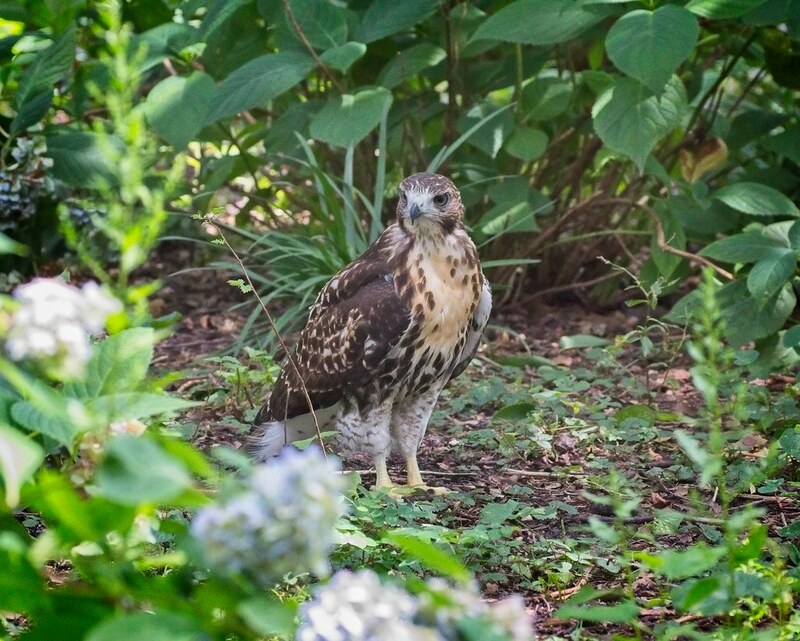 The Tompkins Square Park red-tailed hawk family is doing really well and the two fledglings are out of the nest, exploring the park. 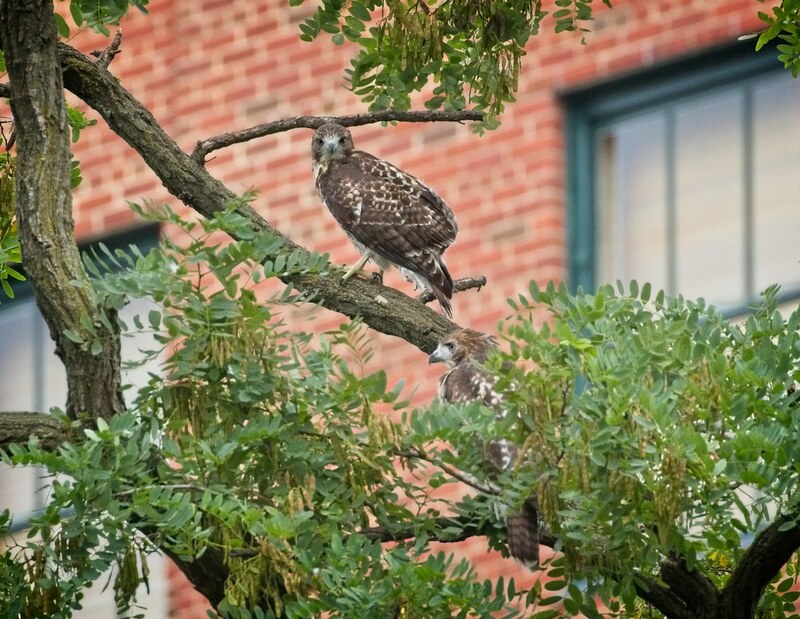 On Saturday, I found both fledglings perched in one of the favorite hawk trees, the tall locust near the Avenue B & 9th Street entrance to the park. 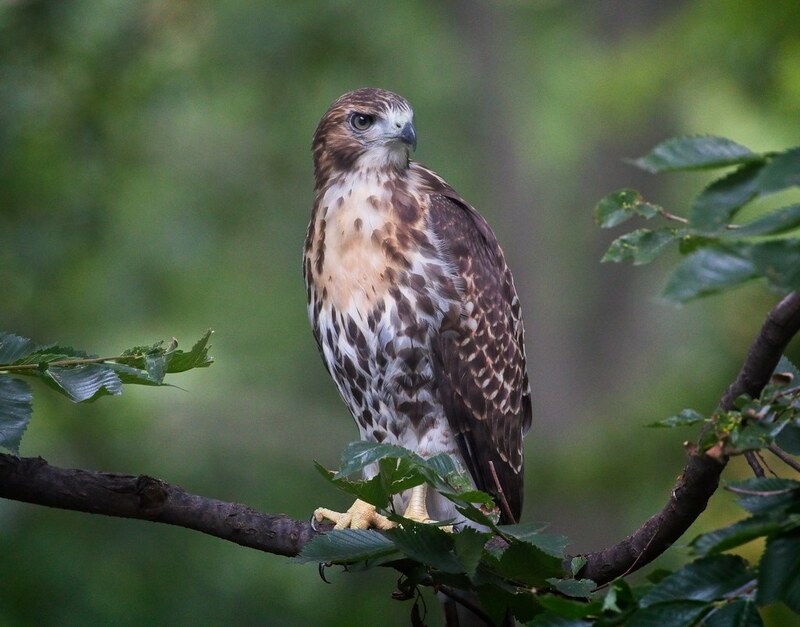 In the photo below, #1 (the older sibling) looks towards the camera while #2 perches just below it, behind some leaves. 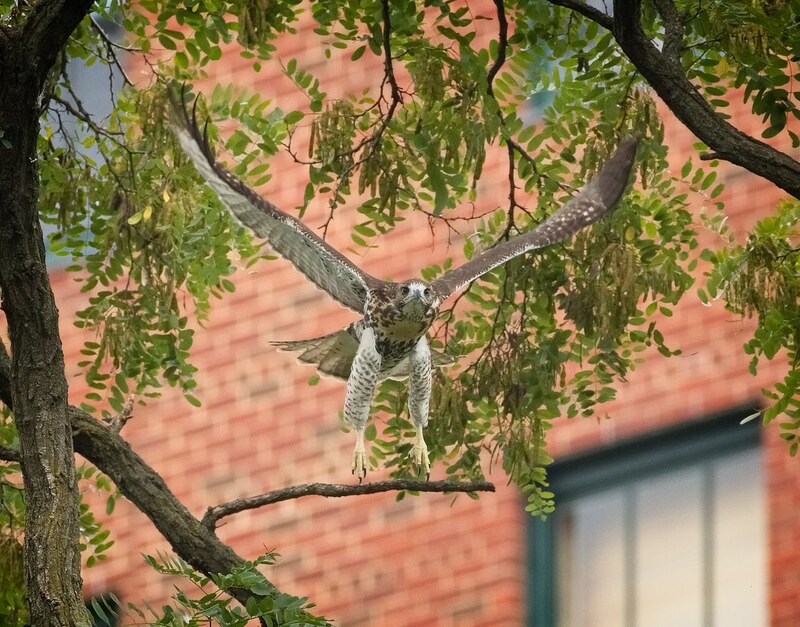 ...and makes a nice flight from the tree. On Sunday, #2 proved to be the more adventurous of the two. Although, it's the younger sibling, it was the first to fledge the nest. Judging by its small size, we're guessing it could be a male. After graciously posing for photos, #2 hopped to the ground and played around in the garden for a while. 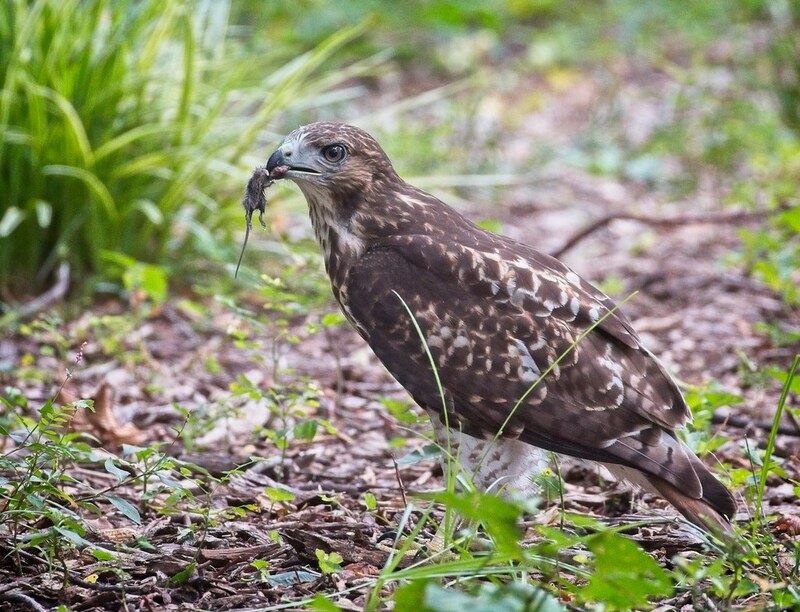 It practiced grabbing prey by picking up dirt clods and bark. 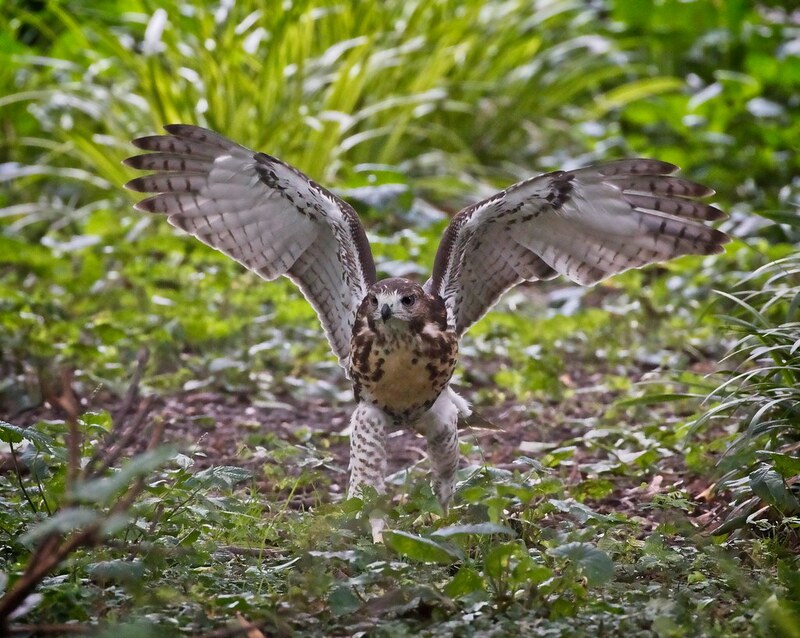 Below, you can see the fledgling is carrying a small piece of wood in its left talon. 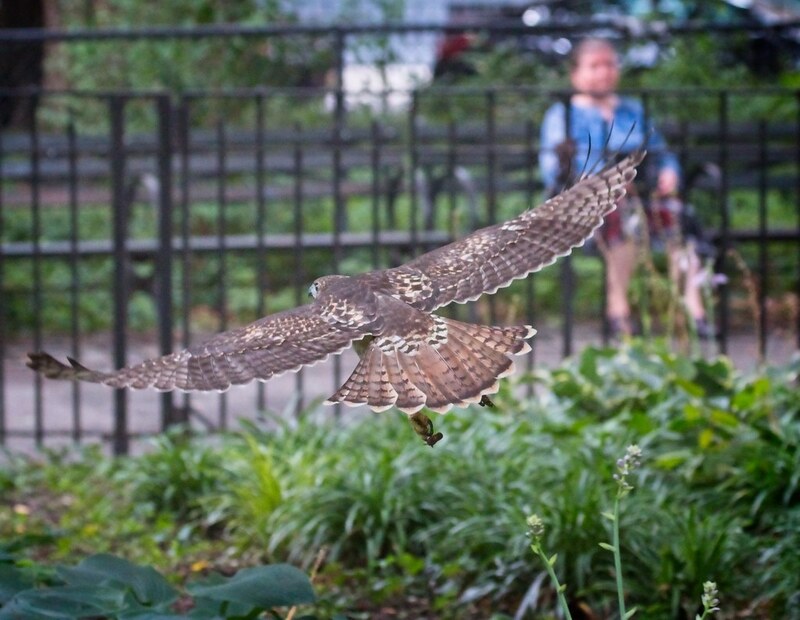 After playing in the flowers on the east side of the park, the fledgling flew right through a live comedy show (heckler!) by the Krishna Tree and to the west side of the park before circling back and landing in the grass in front of the men's room. 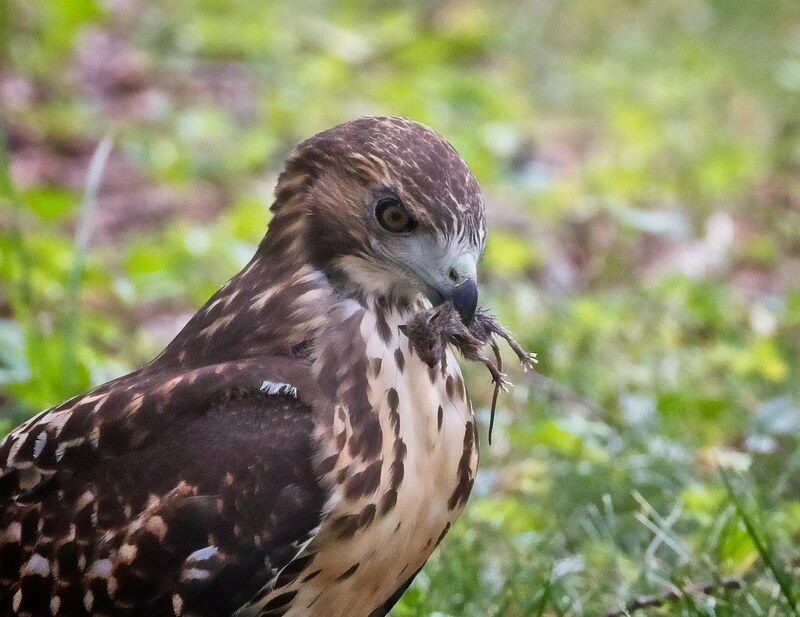 We watched the hawk toy with something in the grass which turned out to be a mouse! 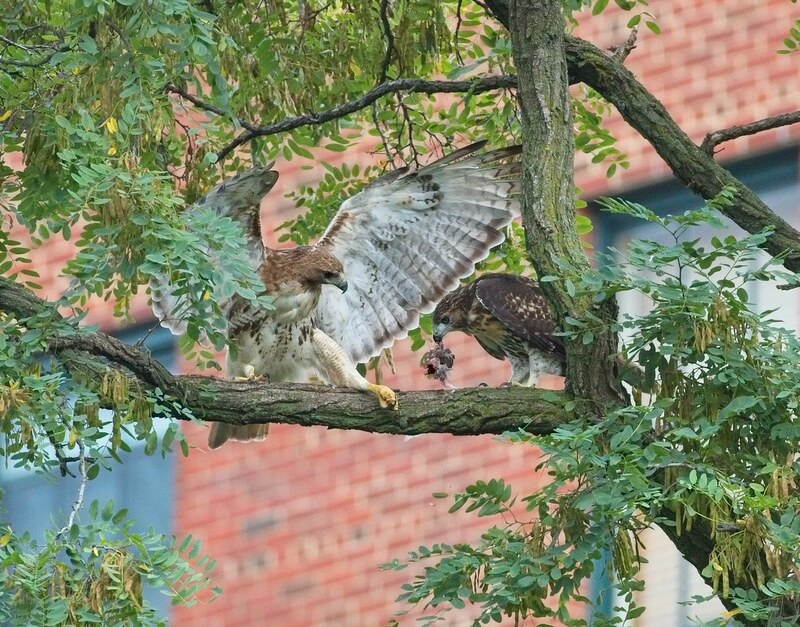 As far as I know, this is the first time the fledgling has caught its own prey. 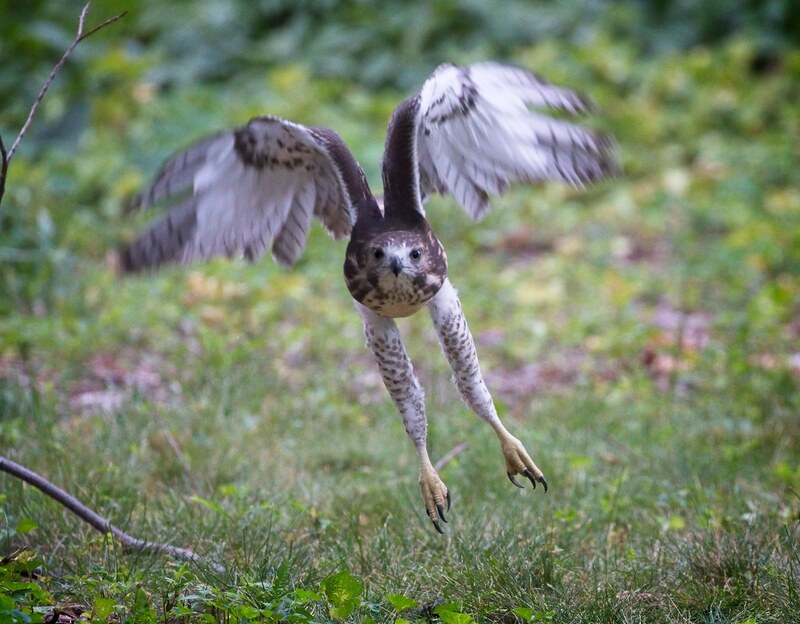 After a few minutes play-catching the mouse, the hawk ate it, then took off to return to the east side of the park. The locust tree seems to be home base now, serving as the feeding station. 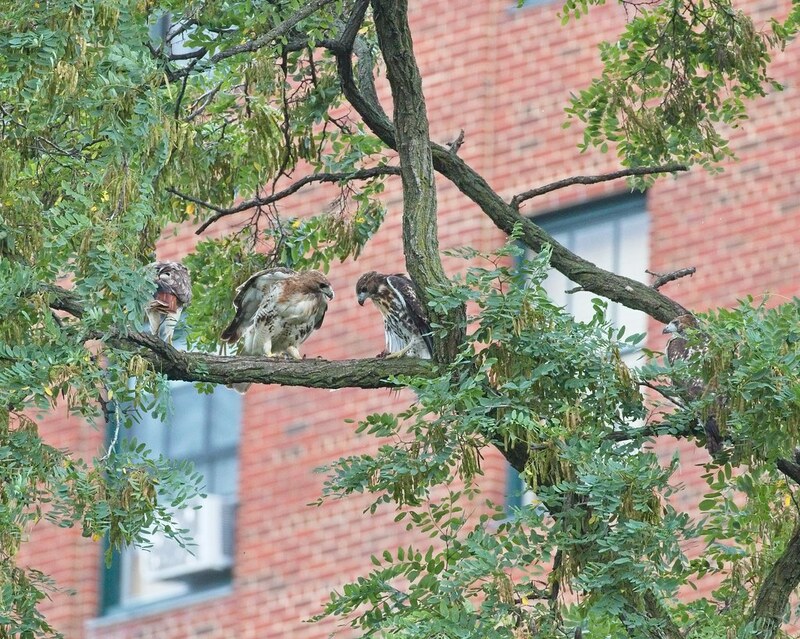 In the photo below, the whole hawk family can be seen with Christo on the far left (his tail showing), then Amelia, #2, and #1 on the far right. 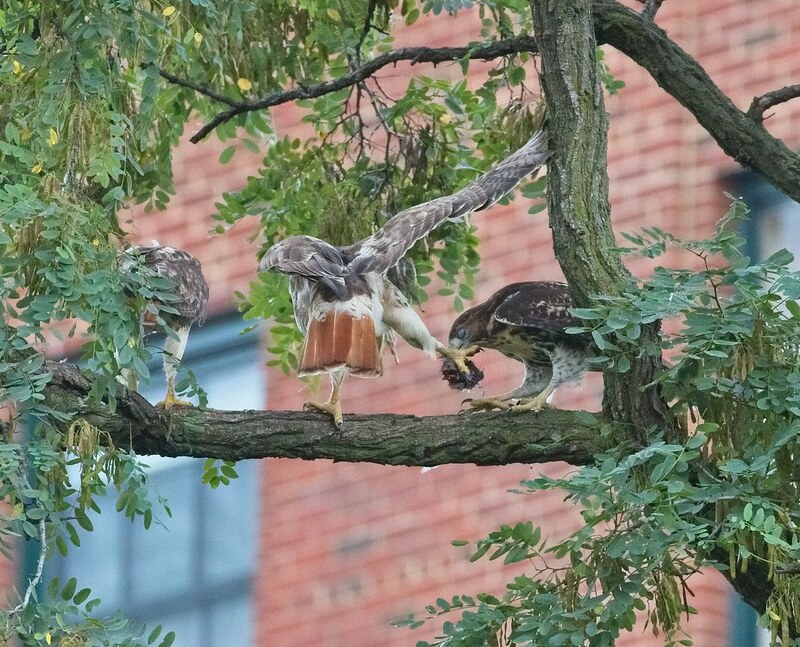 Christo had brought in food (pigeon), which he plucked and prepared before handing it off to Amelia. In turn, she taloned handed it off to #2. 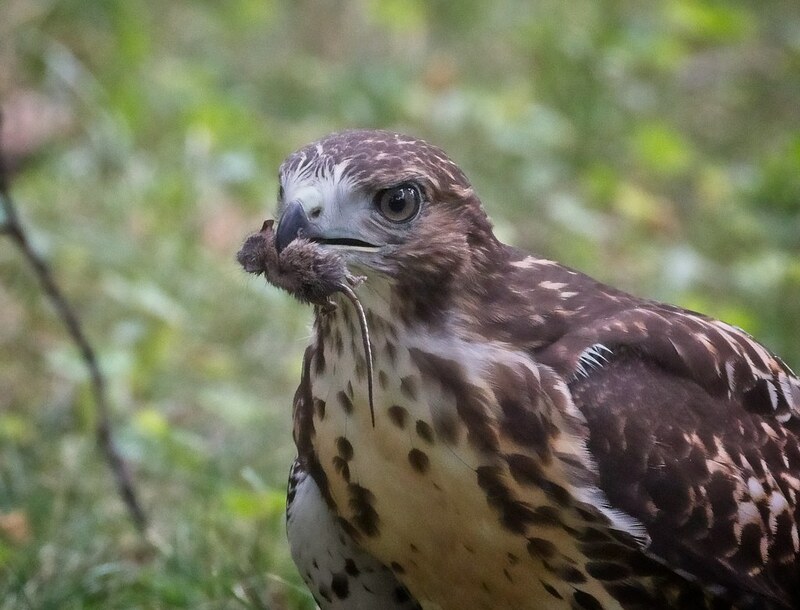 The fledgling must have worked up an appetite flying around, playing and catching the mouse. An exciting day in the life of a young hawk! The fledglings are changing quickly by the day, especially the younger of the two. 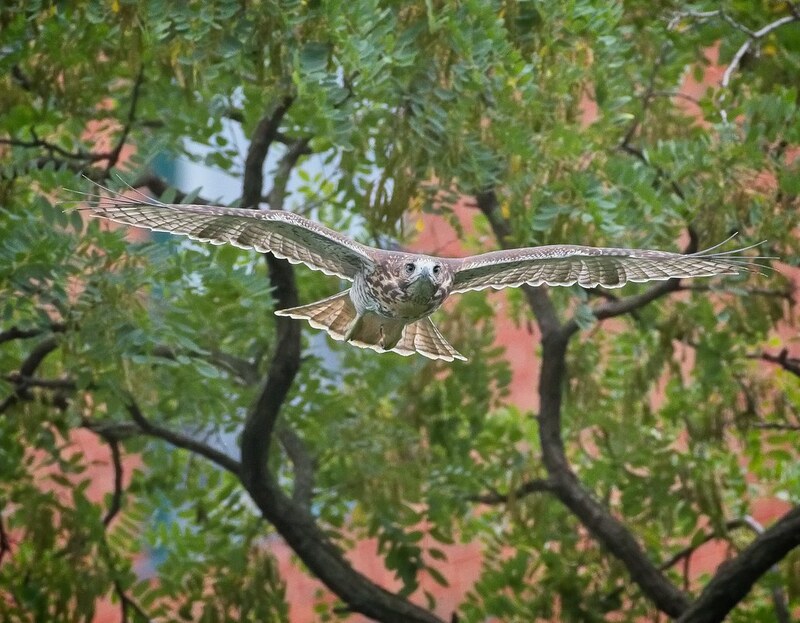 You can see many more recent photos of the Tompkins Square hawks on my Flickr page.